I've decided to participate in the 2017 Riley Blake Rockstar Fabric Challenge. I went ahead a purchased the Rockstar fabric, plus five solids that I thought wold work well. The first blocks I'm making are Disappearing Four-Patch blocks. I've decided to participate in the Riley Blake Rockstar Fabric Challenge. I went ahead and purchased the Rockstar fabric, plus five solids that I thought would work well. The first blocks I'm making are Disappearing Four-Patch blocks. 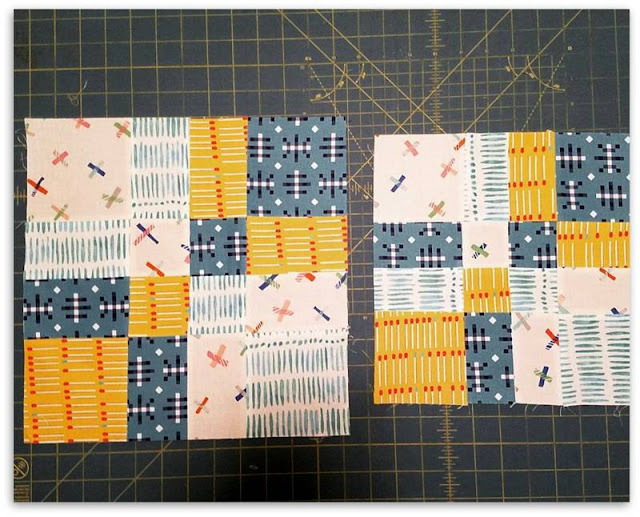 I did two test blocks using different fabric from my stash. I'm using this test fabric in a sampler quilt; so nothing will be wasted. In case you're interested, the block on the left started with four 7" squares and finishes at 12.5", the smaller block started with four 6" squares and finished at 10.5". Once the test was done, I started cutting the Rockstar fabric and made 4 blocks, today. I tried to give them a touch of "modern" by varying the depth of the cuts in the center. There are many more blocks to go and not all of them will be 4-patch. I like it Jan. Has that mid-century modern feel. Thanks, Lesley, I'm trying to "modern" it up a bit.